The US paperback came out about a month ago, and here's the UK edition. I do like the treatment of the type on this one; that misaligned, uneven print appeals to me. It's a nice looking cover, Chip Kidd emulation and all (or is it "Chip Kidd theft?" Oh, the irony...). it's hard to have a totally original idea. and not every book designer has seen every other book cover design, especially 15 year old ones. i think you should give the designer a break. Well, that's an interesting point. Surely, totally original ideas are few and far between. But when I see things like this, I wonder where in the process someone is saying (or not saying, as the case may be) "Hey, isn't this like that Robert Hughes book?" I was a creative director for about 5 years and part of my job was to know what was out there. That the "original" (which, to your point, is most probably not The Original) is by Chip Kidd only makes it more mysterious that we're even talking about this. Or maybe the similarities between two books written 15 years apart don't matter that much. hey, i like the cover—just trying to drop a little levity. it's difficult to pull off a red/green combination and not have it look like xmas. it's a nice looking design. Three years ago I thought of using the back of a canvas for a book cover, but didn't. Graphic designers often go to art school and if they don't paint themselves, their freinds do. I don't think there is plagersim going on here. John Gall used the front of a canvs for the American paperback. It's not the idea, it's the execution. 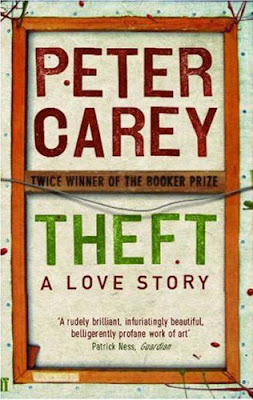 Chip tried the empty space on his cover of theft, which was a clever and quick read, but the girl just made me think of "chic lit", which I don't have a problem with but graphic designers do.